My summer has ended, but little ways in which it has impacted me keep popping up everyday. Here is a video of my summer highlights, spanning my visit to India, study abroad in Tokyo and solo travel in Japan. On my last day in Japan, I beat myself at getting lost. 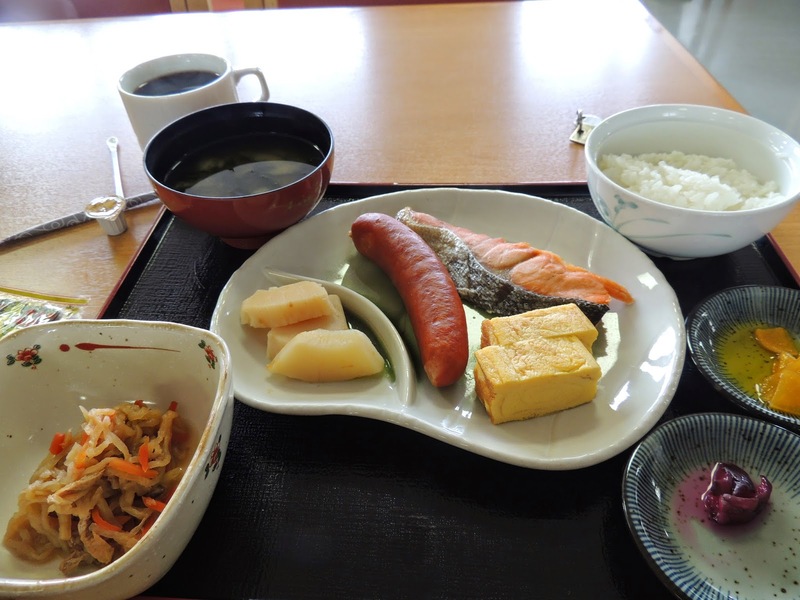 I started the day with a luxurious breakfast which cost 500 Yen ($5) but was worth so much more at the Osaka Youth Hostel, after which I spent half an hour planning the rest of my day. Since I only had one day in Osaka, I wanted to be very picky and particular about what I did today, instead of the usual wandering around. So I sat down with a map and my computer and looked up some interesting areas to explore. I pulled out a subway map and figured out how to get from place to place. I even looked up the must eat foods and the best places to eat them. I left my hostel at 10 p.m. and headed towards Osaka Castle. I loved the train system of Osaka. 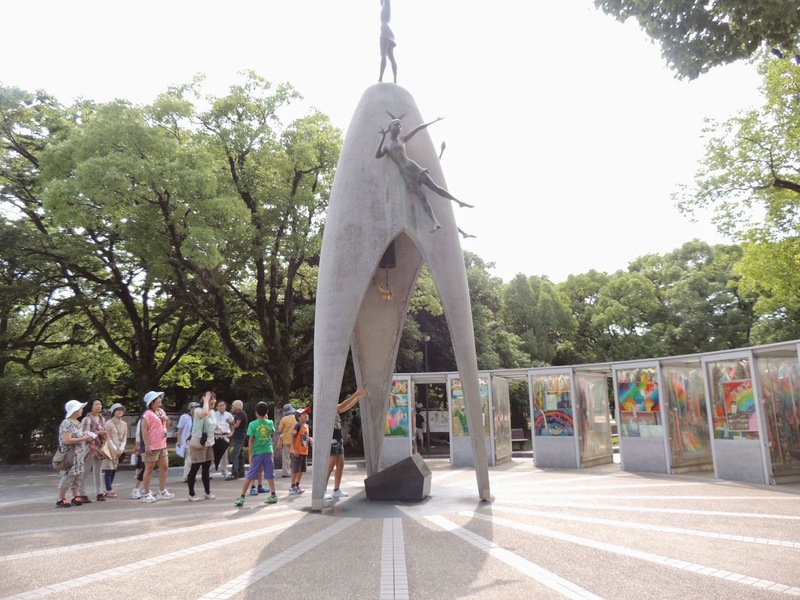 Since Osaka is smaller it takes less time to get from one place to another compared to Tokyo. Osaka Castle was quite beautiful. 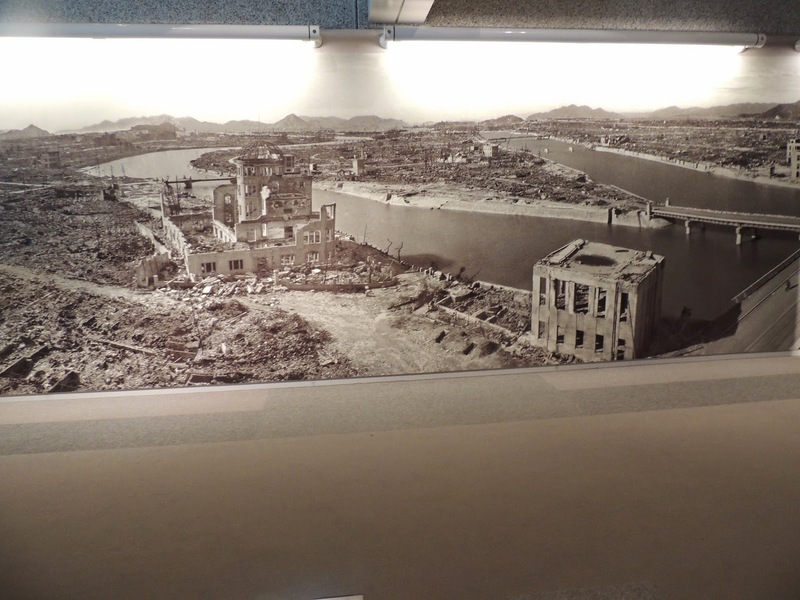 More than the castle itself, the area around it was very nice and reminded me of the Imperial Palace in Tokyo. There were gardens and bridges and lots groves. If it hadn’t been such a hot day, I would have loved to spend more time there. 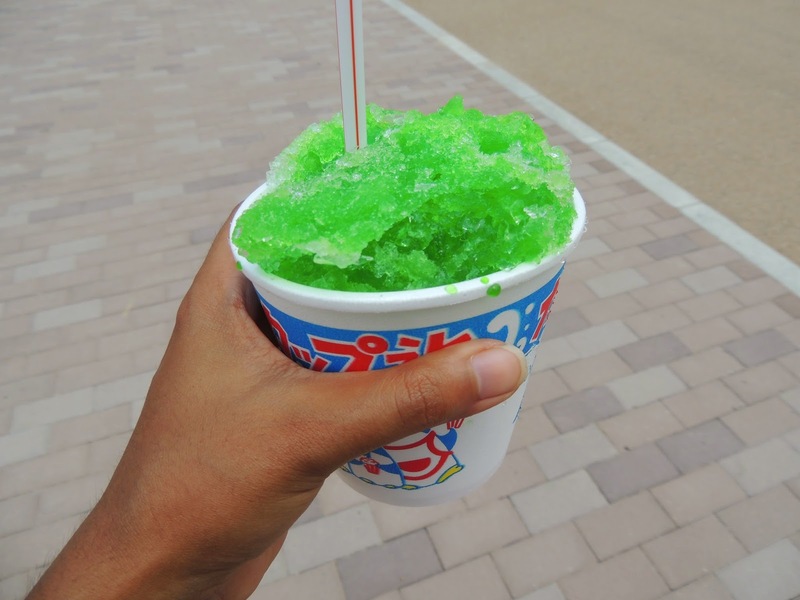 I bought an ice melon that was being sold at one of the many food stall clusters around Osaka Castle and walked around. Things were so far according to the plan. 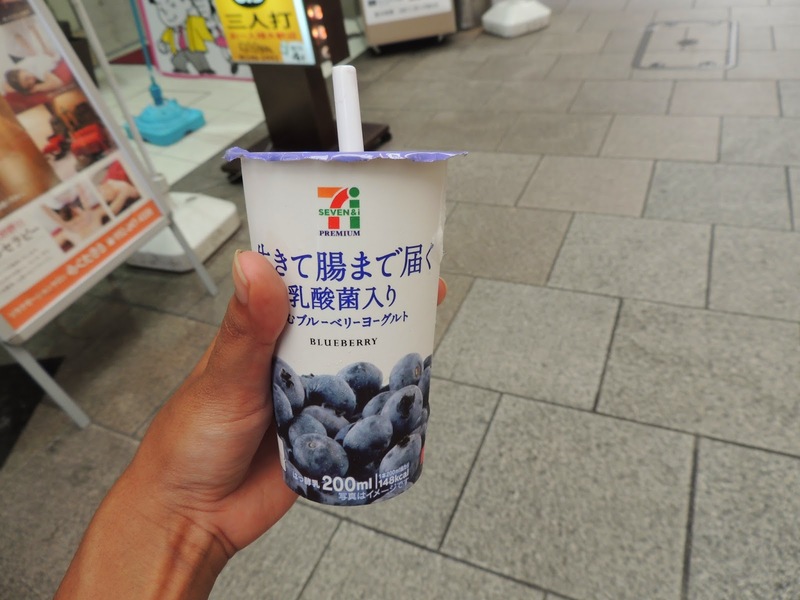 I bought ice melon and walked around. 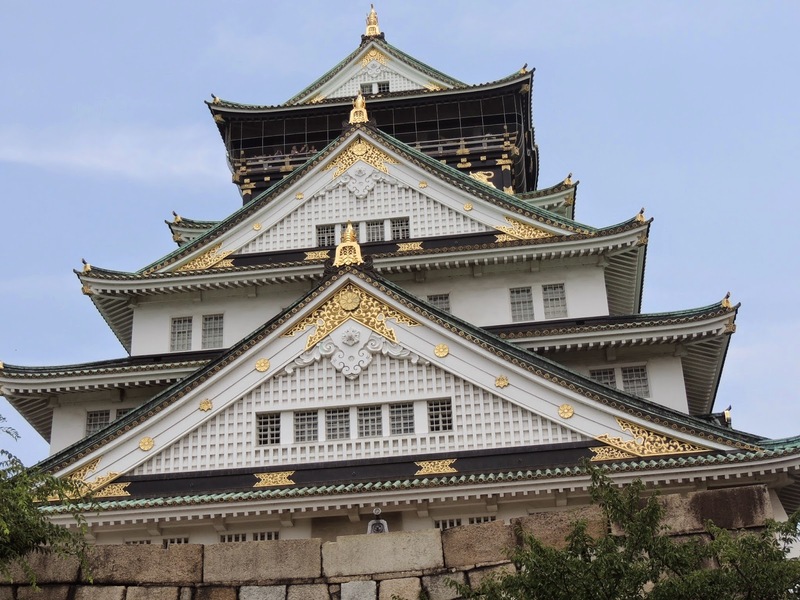 Around noon, I left Osaka castle for the Dotonbori area (one of the downtowns of Osaka). 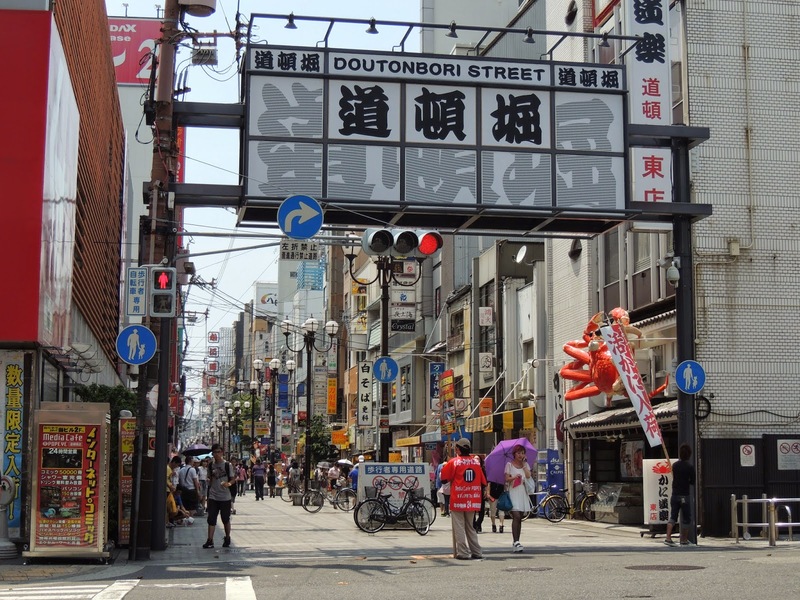 Dotonbori was a touristy area with lots of activity and little shops, restaurants, etc. in the typical Japanese setting of a thin shaded lane that ran across several streets. 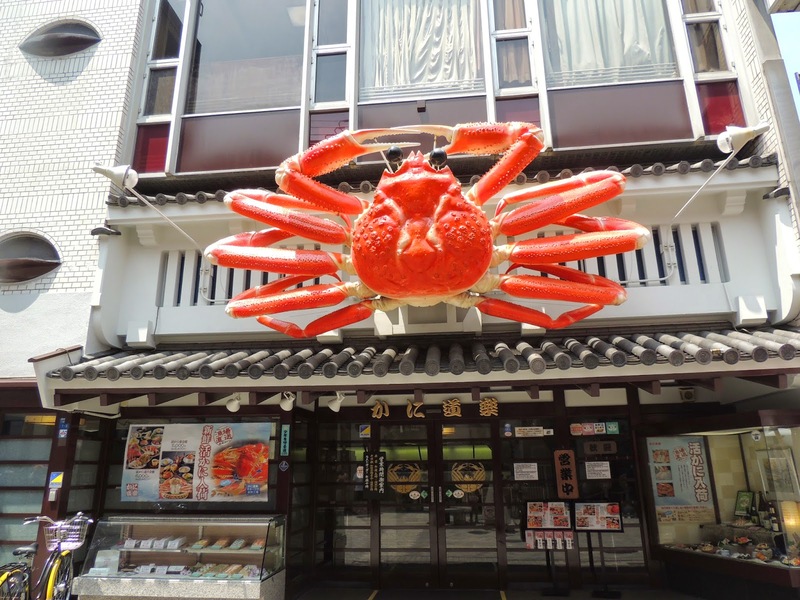 One could easily end up at Namba, one of the other downtown areas of Southern Osaka (which is locally called minami). Here is where I got confused and my plan went down the drain. 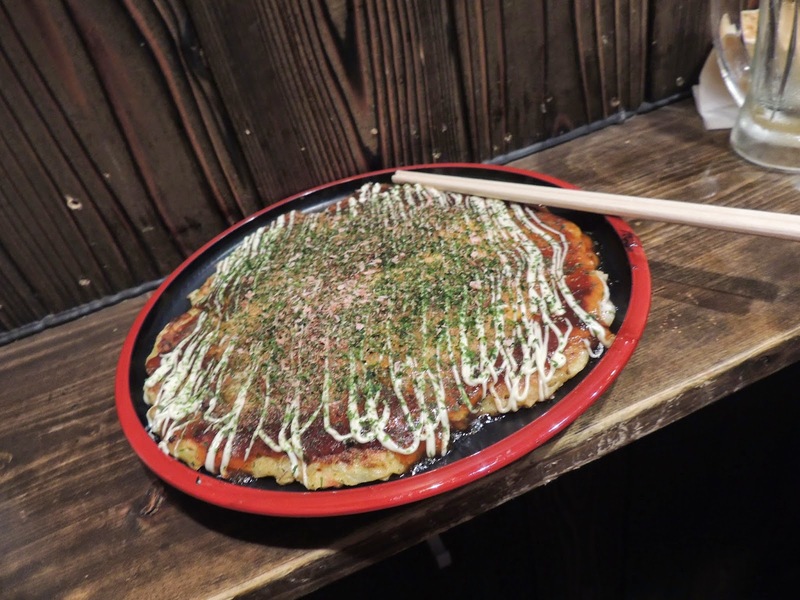 I tried finding a specific okonomiyaki place (the okonomiyaki in Osaka is different from the one in Hiroshima) called Mizuno and ended up looking for an hour. When I finally found it the line was too long and prices were too high. So I took the train to another stop, hoping to find cheaper places to eat. But somehow, I ended back at the same place and found myself walking around in circles. All the streets of the shopping district look quite similar. I was exhausted by this point and ended up eating at a seemingly average place. 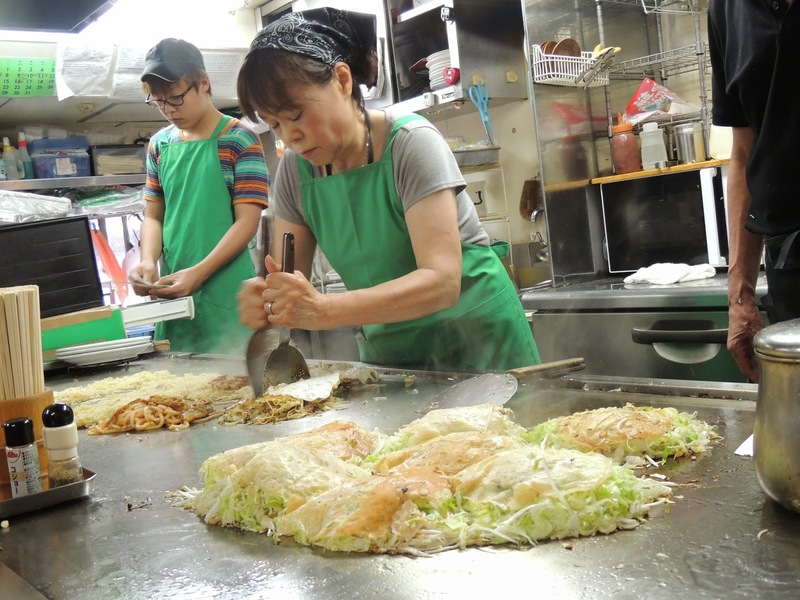 It was one of those little roadside stands selling Takoyaki (fried octopus fritters) with a small restaurant inside serving okonomiyaki among other Osaka specialties. I don’t know if the place I ate at was bad or I just don’t like Osaka’s okonomiyaki that much, but the meal was less than satisfactory. By this time, I was extremely exhausted and dehydrated. So I changed my plan and decided to skip Shinsaibashi (another downtown area of Osaka) and go straight to Umeda (a business district with lots of department stores in the northern part of Osaka called Kita) to pick up some last souvenirs and gifts for friends back home. 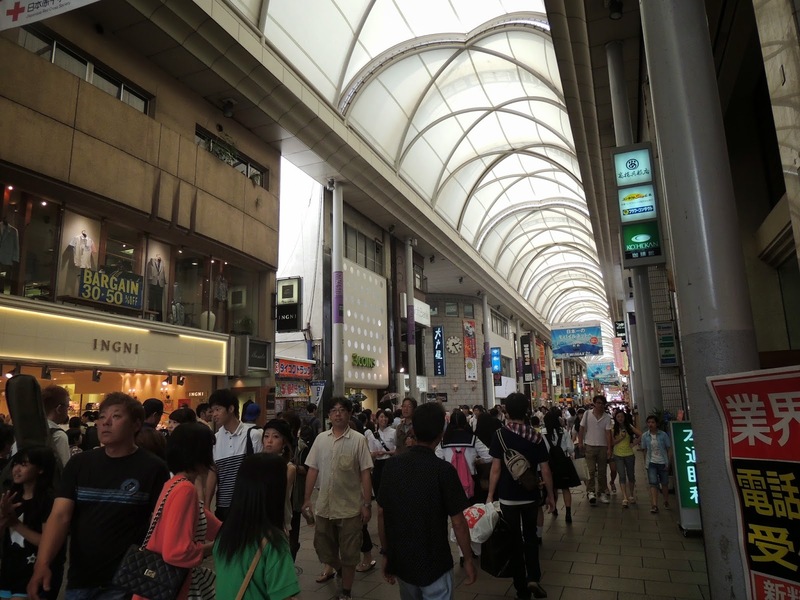 Umeda was impressive with magnificent buildings and architecture, and overhead bridges connecting all the department stores to each other. 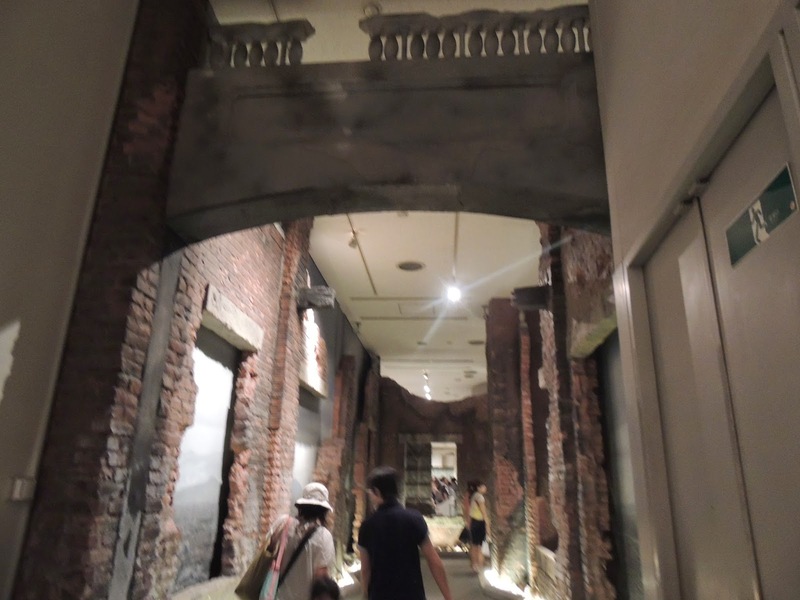 The department stores were unimaginably expensive and very fancy. Although they’re a nice place to window shop, I couldn’t bring myself to actually shop here. So I gave up and headed back to shin-osaka, where my hostel is. Although it was only 4 p.m., I was ready to go to bed. Luckily, when I reached shin-osaka station, I found a range of souvenir shops where I was able to buy what I wanted (generally, the stations from where the shinkansen leaves have quite a few stores and restaurants). After returning the IC card that I had been using for commute during the last two months and figuring out where the airport limousine (a bus service that goes directly from Shin Osaka Station to the domestic Itami airport) leaves from, I went back to my hostel. I was feeling better now and spent some time chatting with people at my hostel over a konbini dinner. 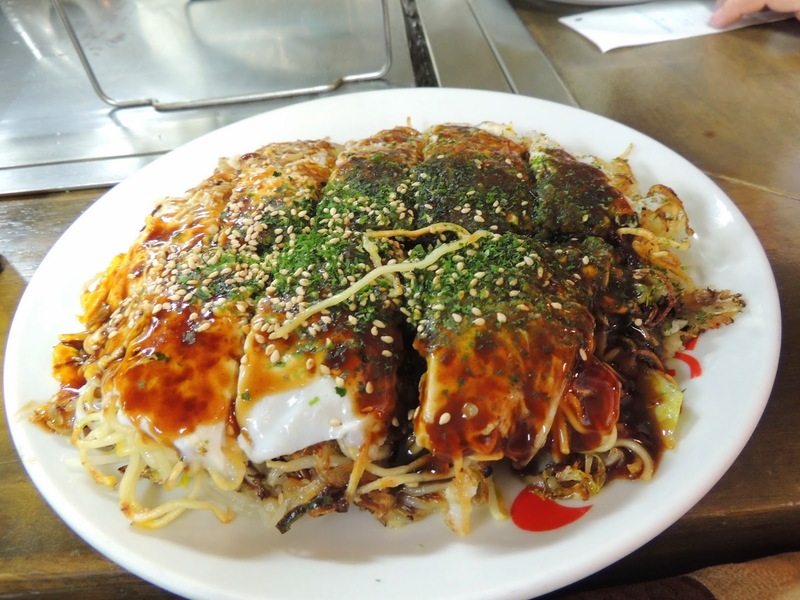 I unfortunately wasn’t able to try Takoyaki, which is another of Osaka’s specialty. Osaka felt like a mini-Tokyo or a less intense version of it. People seem to be a bit nicer and less rushed. Not too many tourists were spotted. 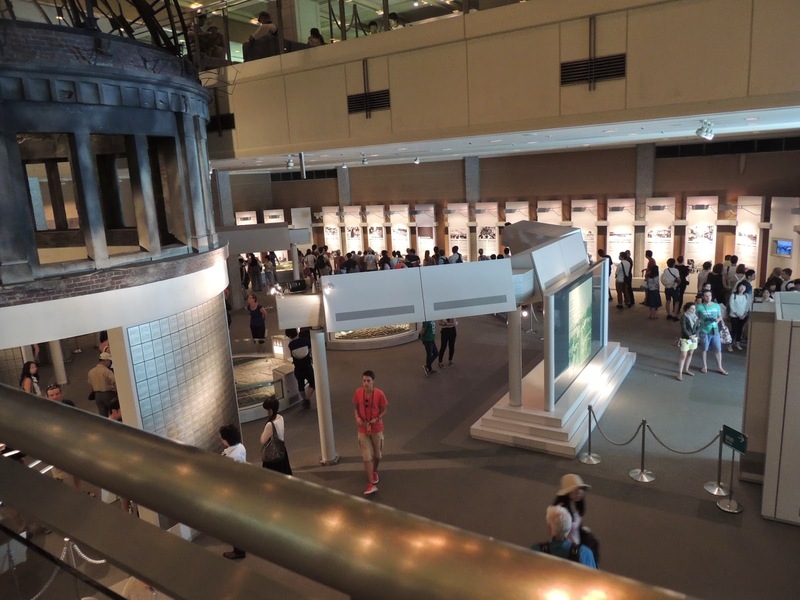 Although there were quite a few attractions such as temples, downtown areas, etc, I didn’t feel the need to go to all of them, because I felt like it wouldn’t be too different from what I’d already seen in Tokyo or other parts of Japan. 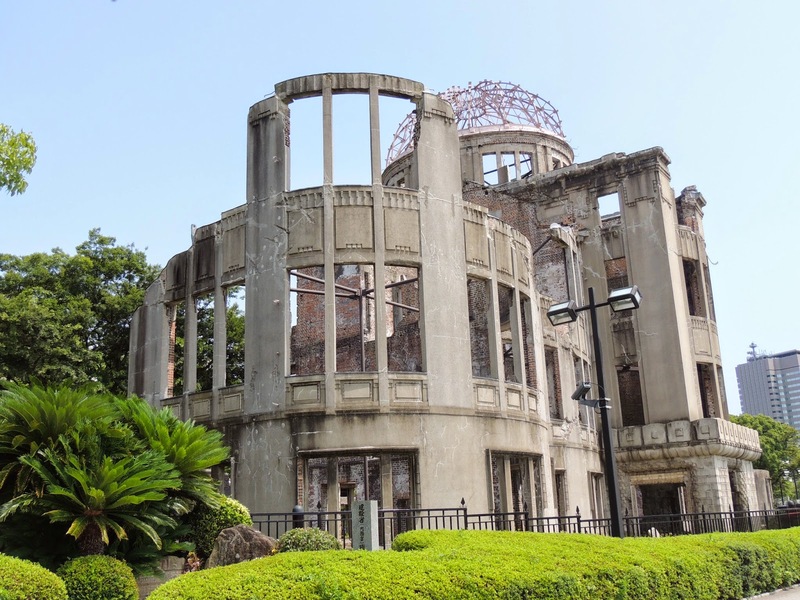 Since I did some planning and research before going out today, I felt like an informed tourist instead of just wandering around and taking pictures of things. I could connect things with what I’d read about them online. I unfortunately couldn’t follow through my whole plan though, which is something I can work on during future travels. My last day at the farm started at 7 am with weeding. Although it still felt tough and physically taxing, I pulled through 3 hours of weeding. After that I did some carving on the wooden deck. Later, Sayaka-san had a group of 5 ladies for lunch and needed help with the kitchen and in serving them. 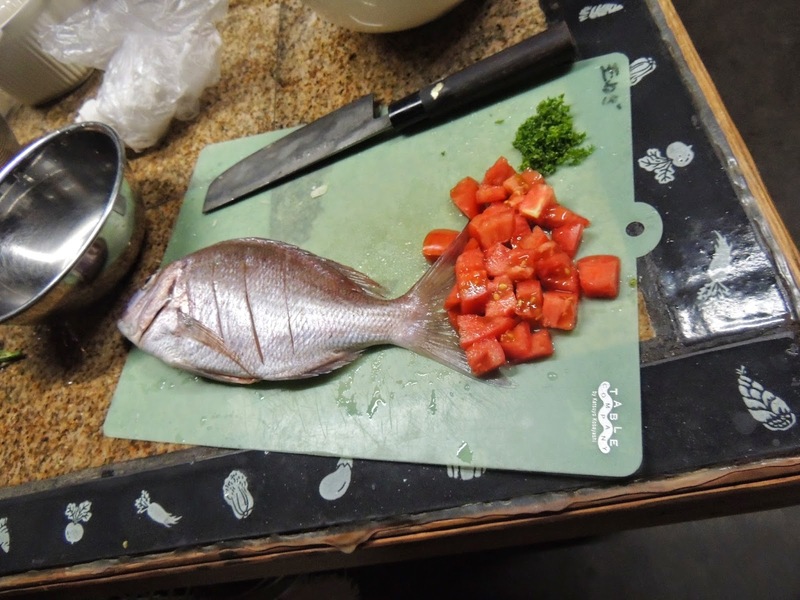 There was a certain way to set the table and specific sides from which to serve and to pick up the dishes. 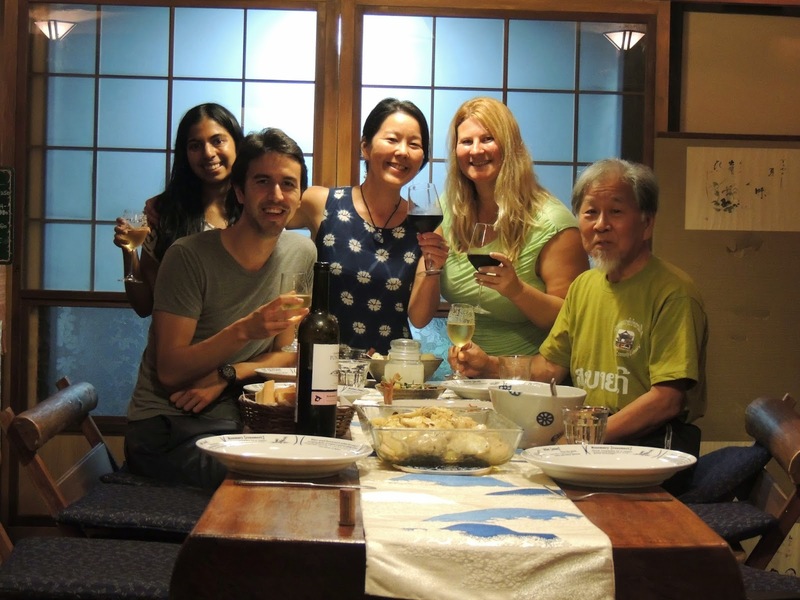 Sayaka-san’s father came for the night too and Celso and I ate lunch with him while Sayaka-san was busy in the kitchen. It started to rain quite heavily and we were indoors for the rest of the day. The rain was so bad that there would be lightening every now and then which would shake the house and make us jump. Since we had started early, there wasn’t a whole lot of work to do in the afternoon apart from drying dishes. Later in the evening Sayaka-san’s friend arrived from Tokyo for Sayaka-san’s birthday which is tomorrow. We cooked Portuguese dinner. We all ate together and drank some wine. The interaction between Sayaka-san and her friend was akin to mine and Shivani’s (my best friend) on one of our sleepovers. 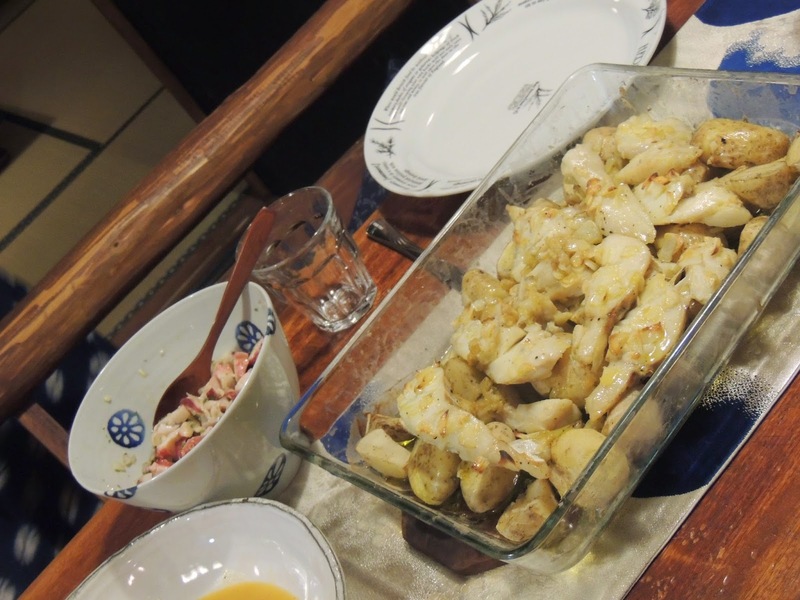 Portuguese dinner featured octopus salad, grilled fish and potato. It had lots of garlic and olive oil. We chatted for a long time afterwards and it was a perfect last meal. Sayaka-san’s neighbor presented her with a freshly caught fish for her birthday! After the English cafe, we went shopping for groceries in the evening. I bought a green apple and what turned out to be chocolate (it resembled an ice cream cone but wasn’t cold). I later learn that it was called Giant Caplico. A Giant Caplico: looks like an ice cream cone, but is actually just chocolate. I bought the cookies and cream flavor. YUM! 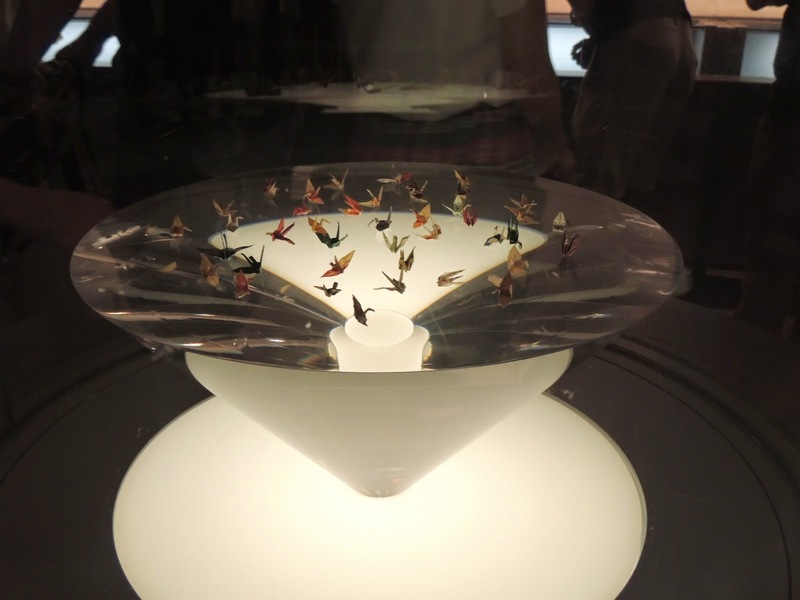 Japanese konbinis continue to enrapture me even after a month and a half of daily visits. Afterwards, Celso picked up Japan’s unique and somewhat popular shrimp burger from Mcdonalds. 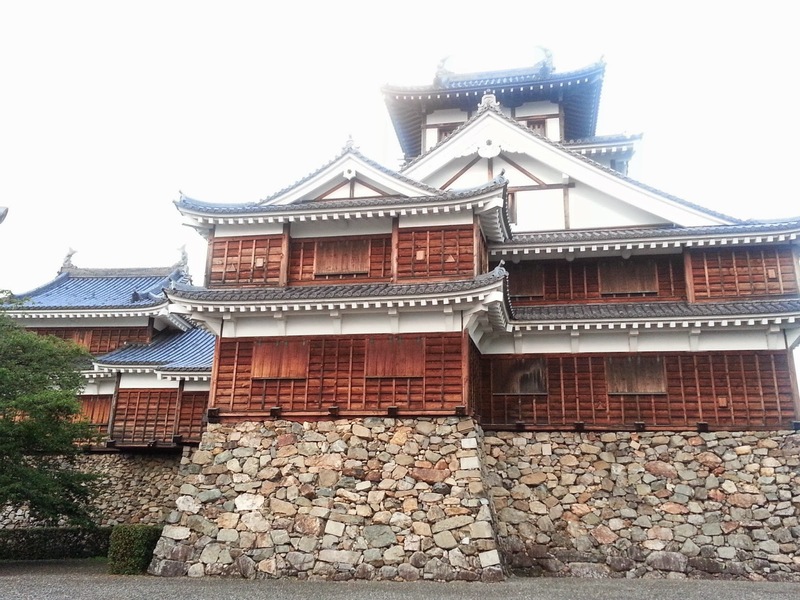 We drove to Fukuchiyama (about 30 minutes away) to see Fukuchiyama castle. The castle had been rebuilt 20 or 30 years ago but still looked traditional. 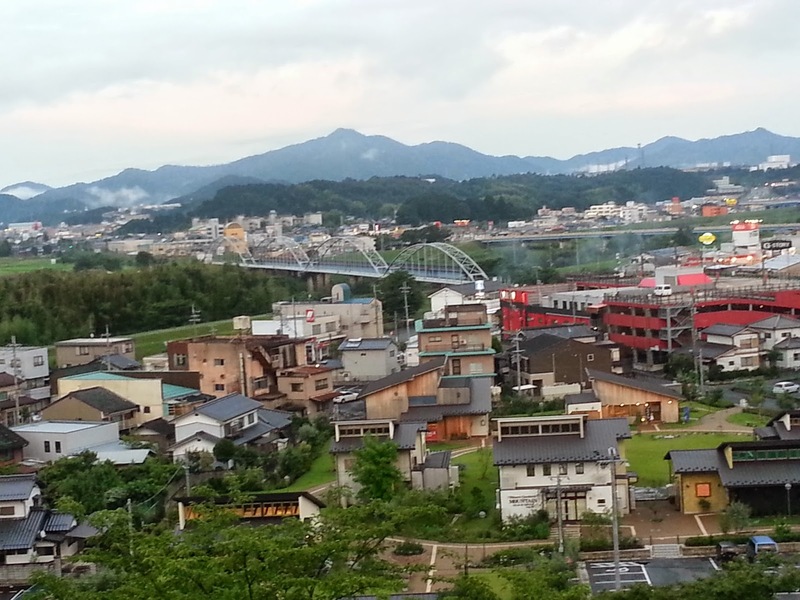 The city was double the size of Ayabe but still quite traditional looking. 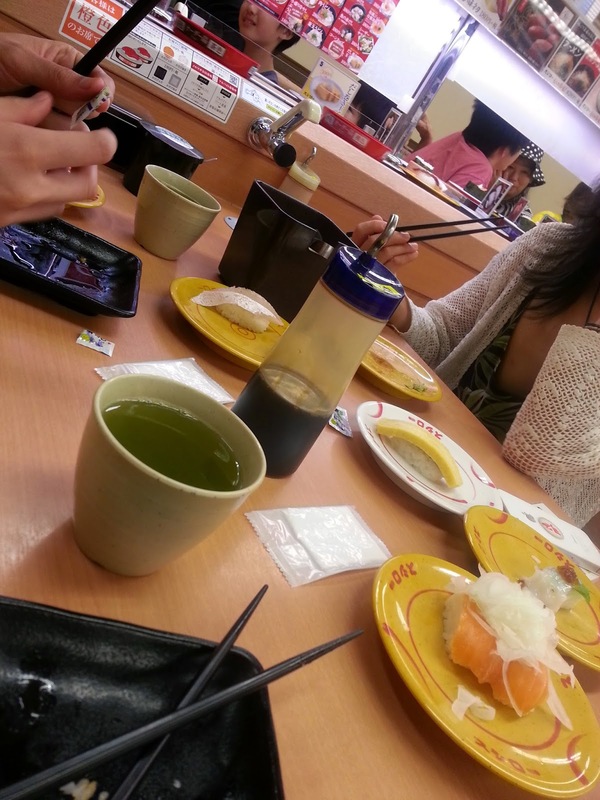 We decided to go for sushi for dinner to Kaiten zushi (conveyor belt sushi restaurant chain). Sayaka-san loves sushi and said that she once drove to a sushi restaurant straight from the airport after a 2 month trip abroad. 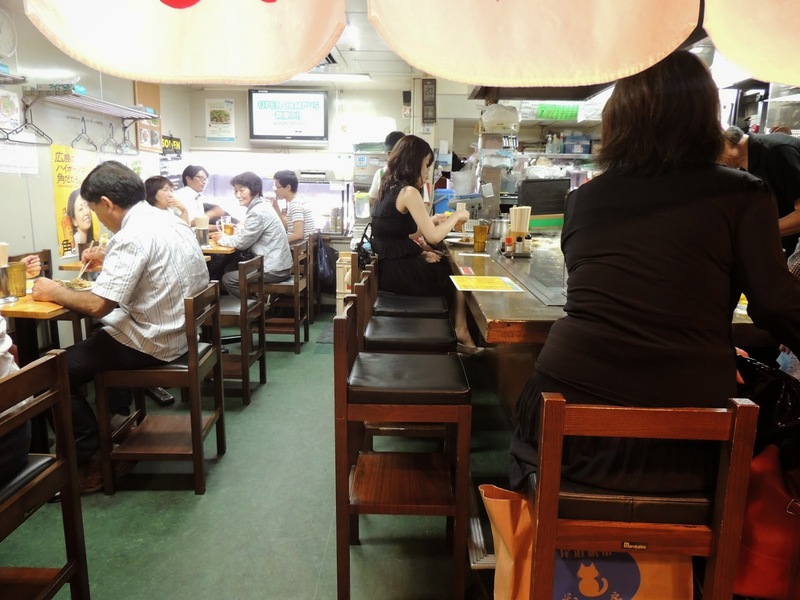 This was the same restaurant I’d gone to in my first week when I was in Tokyo with my host family. I enjoyed sushi more this time than my first time. I like to think that I’ve developed more of a palate for different kinds of sushi, though it could simply be difference in quality in the two different restaurants I went to. I asked Sayaka san over dinner what the hardest part of farming is. She said weeding because it needs to be done all year round. But she also said that it isn’t too hard to perform farming tasks physically. The tougher part is gaining the knowledge of weather, nature, etc. required to maintain and run a farm. Tomorrow is my last day here. I’m excited to be heading home soon, but also sad to be leaving. I have started to understand why people love Japan so much. It is equivalent or superior to any other developed country in terms of its safety, ease of travel and wide choice of food. Moreover, it has a deep culture and history to it. It has invented all kinds of things and been a pioneer. The roots of games, technology, etc are here and they show very well. At the same time, people here don’t misuse their power and continue to be humble. I think I will return to Japan. This is unlikely to be my last time here. I am glad I’ve gotten to see 8 cities of Japan already (and will probably see 10 in total). But there’s a lot more, I know. In lieu of the second day of English cafe, no field work today either. I spent the morning cleaning and doing other small chores around the house. Its getting quite hot during the day which is why Sayaka san suggested doing weeding tomorrow early morning. The English café had a kids session today. There were lots more people, and so many kids. Celso and I were asked to interact with them over some activities. The kids were of all age groups from 6 months to 6 years old and they were running around. Activities included singing songs, listening to stories in English, collecting bugs and finding out their English names (never before have I come across a situation when the adults ask the kids to go play in the mud with insects) and playing football. The mothers were there throughout and they spoke a bit of English too, some better than others. After being in a controlled, orderly sort of environment for the past month and a half, it felt unfamiliar to see all these kids running around full of energy, completely uncontrolled. 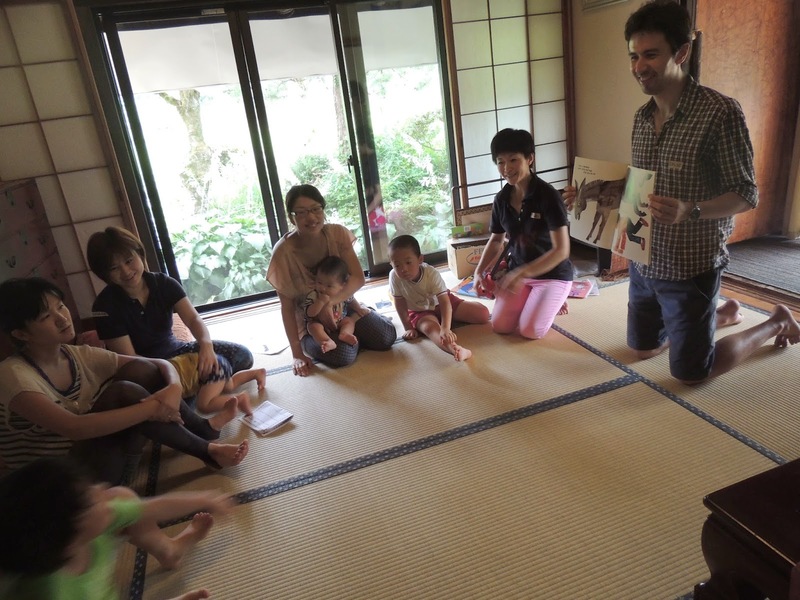 Their mothers ran after them encouraging them to do the activities and learn some english words. Although the kids were more interested in running around and playing with each other, they learnt very fast and some of them were very eager to learn English. Today was the day of Sayaka-san’s English Cafe. Once a month she invites people over to her cafe to interact with foreigners (WWOOFers like me and Celso) in English. 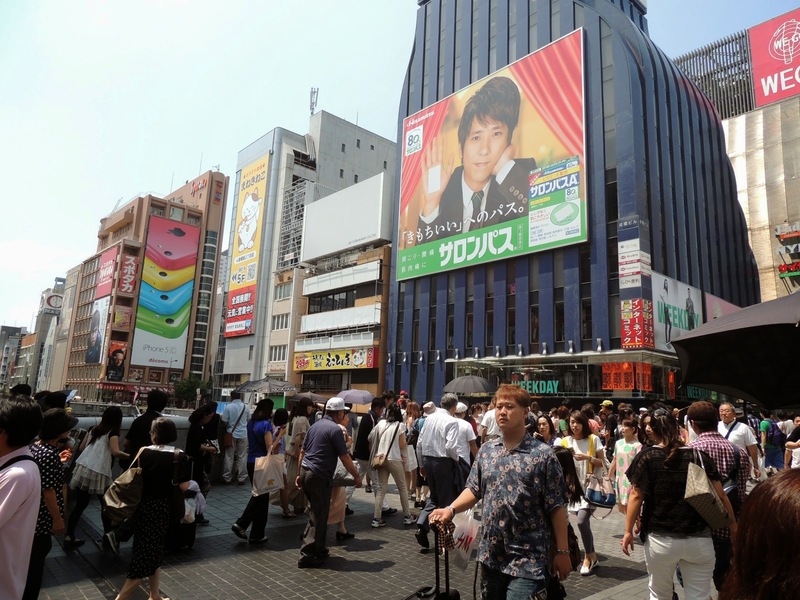 As I discovered yesterday, Ayabe doesn’t see many foreigners and this is a good opportunity for some exposure. The English cafe was to be held on two days this time-Thursday (today) and Friday. 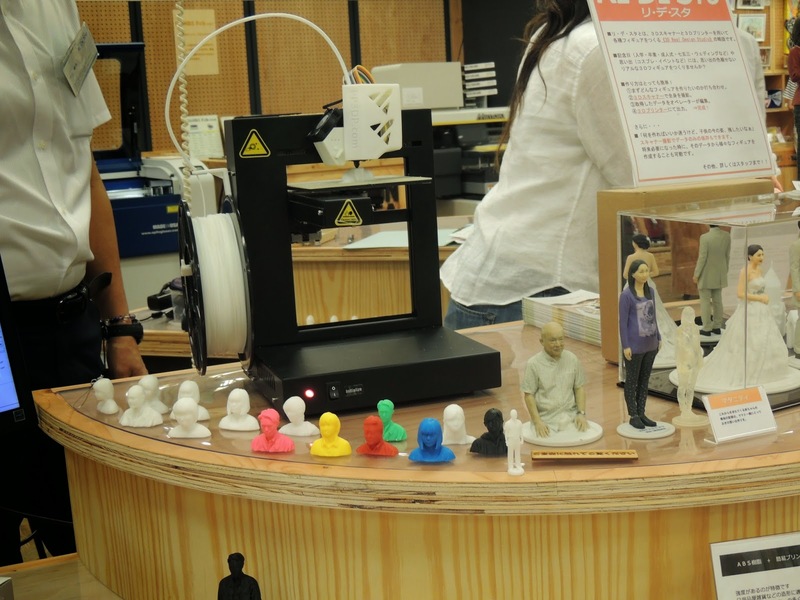 One of Sayaka-san’s friends, Yuki would come over to take an hour long class for adults on Thursday and kids on Friday. So in preparation of the english cafe to be held in the afternoon, we didn’t do any field work today and did cleaning in the morning instead. Sayaka-san was busy cooking in the morning. 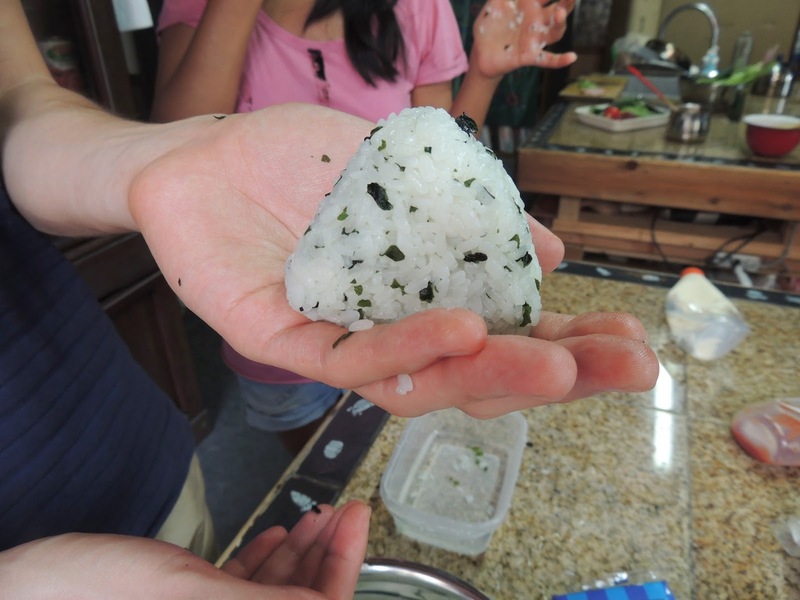 Still, she had enough time to teach us how to make onigiri (Japanese rice ball), which involved taking some sticky rice in your wet hands and giving it a triangular shape. It took me a few times to get it right, especially since my tiny hands didn’t cooperate when it came to making larger sized onigiris. But I was surprised to see how simple it really is to make onigiri, which I hadn’t realized before having seen onigiris only sold in convenience stores. 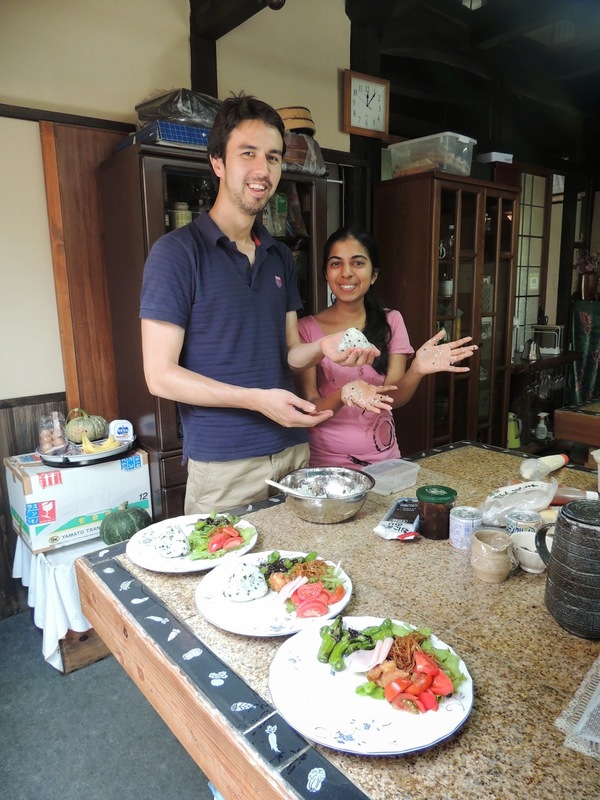 The English cafe started with Yuki coming over for lunch with her 5 year old son. Yuki had studied abroad several times in the US and UK and spoke fluent english. She was an english teacher is school and liked to take classes outside as well. Her son loved insects and bugs and kept running around the farm after them. He caught frogs and grasshoppers and would bring them back to show us. running after insects. 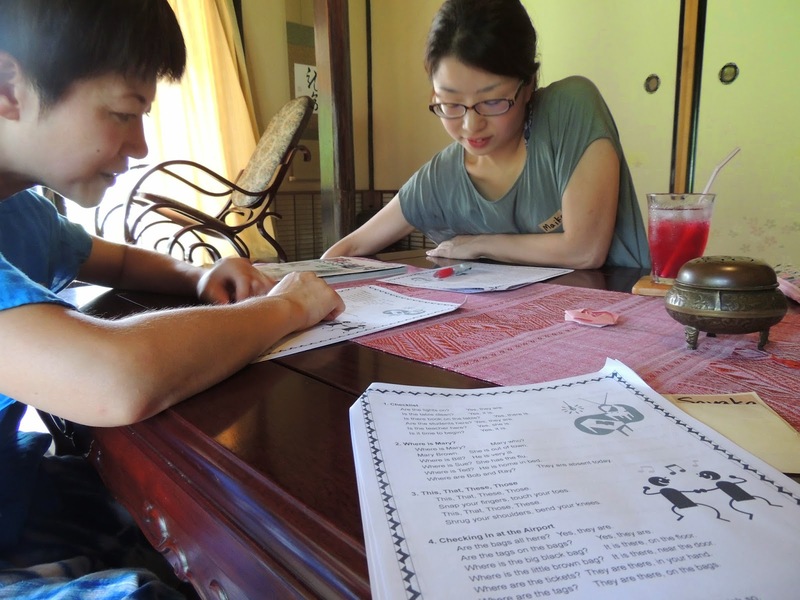 After lunch, the class for adults comprised of English worksheets, listening activities, reading, etc. Celso and I sat through the class. It was fun. Although there was only one adult today, she was very motivated to learn and we spoke to her and Yuki for an hour after the lesson was over. I also met Sayaka-san’s neighbors who had come over for a drink to the cafe in the afternoon. They were a couple (seemingly in their 50s) who are visiting Singapore in September. Although we couldn’t communicate very well, we exchanged contact details for meeting up in Singapore. I was exhausted after all the talking, and fell asleep in the afternoon. Then I watered the fields. It hadn’t rained today or yesterday and the fields were very dry. There were cracks in the ground. 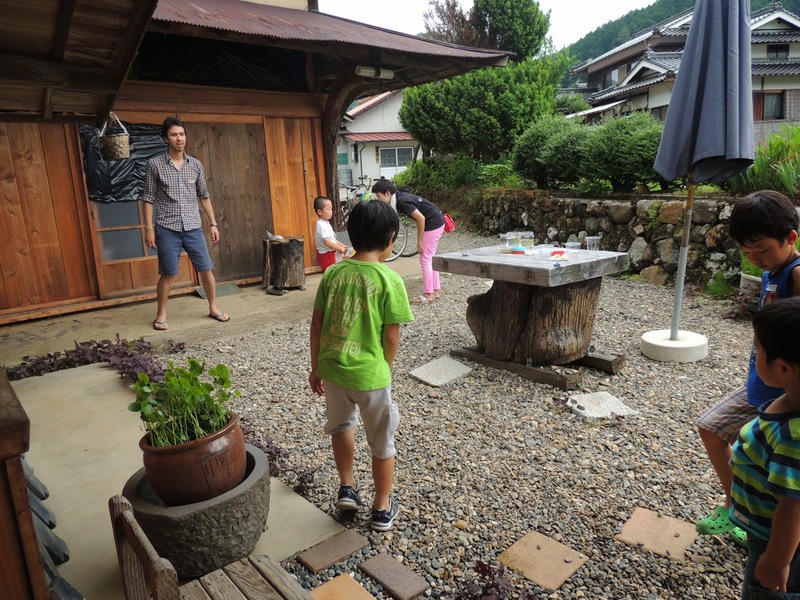 I loved using the hose at Sayaka-san’s house to water the fields and garden. It had different kinds of sprayers in it and was very strong. We ate soba for dinner and Celso and I watched another fascinating TED talk after dinner called ‘Why 20s are not the new 30s’.